ACE Hawaii Continues to Round it up with amazing dollars! $5,341 raised in 7 days bringing the Hawaii total to $19,313! 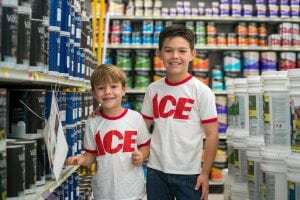 Congratulations go to Kamuela Ace Hardware who is ranked #4 in the country for fun raised! ACE Locations throughout Hawaii wrapped up thier round-up campaign with a total of $24,735.86 for 4 weeks! Mahalo to ACE Hardware for all they do here in Hawaii!